Sean Kiebzak (front) poses with Bradley Tech interns (from left) Brionna Jeffries, Zion Griffin, Deovyian Banks, Rebecca Schanen, Giovanni Perez and Jamie Daniels. Photo by Keith Schubert. About 70 community members participated in installing a 7,000-gallon underground cistern for the new Paliafito Eco-Arts Park, one of the last steps before the Walker’s Point park is complete. The park, a project of Arts @ Large and Reflo Sustainable Water Systems, will serve as an “eco-arts” learning center, engaging students, families, educators and neighborhood residents in hands-on, project-based environmental and arts learning. The half-acre park, at S. 3rd and W. Walker streets, also will host multiple free summer programs, such as an acoustic concert series called Music Under the Stars, in partnership with Latino Arts and Wisconsin Conservatory of Music, and youth-driven theatrical productions of Shakespeare plays. Programming also will include yoga, art making and culinary arts workshops. 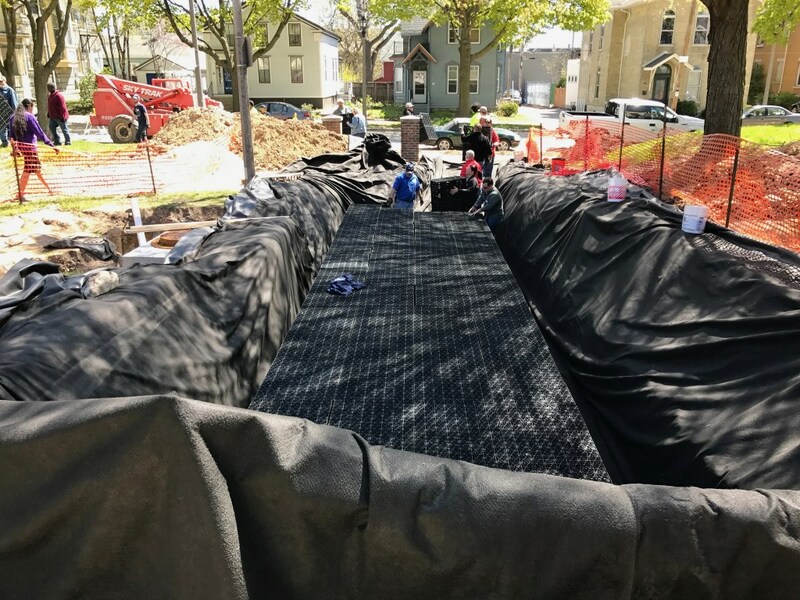 An enormous tarp is laid out to hold the 7,000-gallon cistern. Photo Courtesy of Arts @ Large. The cistern will serve as an underground water catchment system to collect rainwater and provide water for the park. However, the benefits will reach beyond the park, said Justin Hegarty, executive director at Reflo. The park is scheduled to be finished by mid-July. “It’s something the community has been hungry for,” said Sean Kiebzak, program director at Arts @ Large. The turnout to install the cistern is testament to that, he added. Organizers expected about 30-50 volunteers, and more than 70 showed up. The Bradley Tech interns have been working with Arts @ Large for the past year learning about construction management and engineering. They have been participating in hands-on projects such as Paliafito Park, as well as attending workshops on construction and engineering. Many of the interns, such as Zion Griffin, a junior at Bradley Tech, are planning to take the construction and engineering career pathway. “I’ve been working with Arts @ Large for a while and it’s been very helpful. … I’ve been learning a lot by working with them on this project and others,” said Griffin. Intern Alexander Reyes, a junior at Bradley Tech, said the park provides value to the community. “I’ve lived in Milwaukee my whole life and a lot of people give it a bad rap, but to see the community come together and grow and bond together helps eliminate the bad rap. It’s a good feeling,” he said.